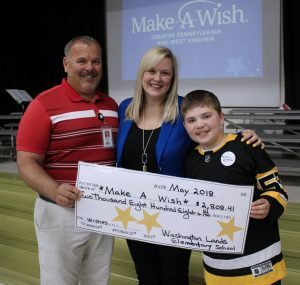 From left: WLES Principal Mike Berner, Make-A-Wish Regional Manager Jackie Auten and MMS student Raymond Steed. 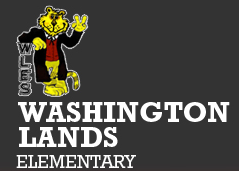 Putting together a fundraiser for various charities has become common at Washington Lands Elementary School. Whenever someone is in need, the school community begins planning its next charity event. Recently the faculty, staff and students collected money for the Greater Pennsylvania and West Virginia Make-A-Wish organization. They were inspired by former student Raymond Steed, who is now a 6th grader at Moundsville Middle School. In November Steed was granted a wish to skate with the Pittsburgh Penguins hockey team. Since then he has been doing his own fundraising to give back to the charity who helped him. Steed, fellow classmates and teachers at the middle school raised a little more than $2,000. The Washington Lands Wildcats collected $2,808.41. During a school assembly on Friday, WLES Principal Mike Berner presented Make-A-Wish Regional Manager Jackie Auten with a check.